It enjoys a superior geographical location and convenient traffic and it’s the ideal choice for your business and holiday trip. 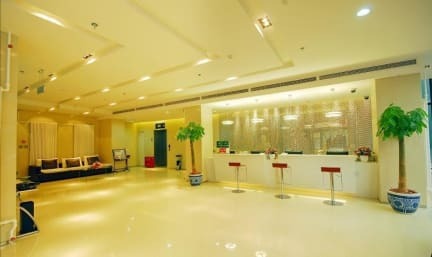 It’s 2 km, 5 minutes’ drive from Beijing West Railway Station; 10km, 20 minutes’ drive from Tiananmen Square; 11km, 20 minutes’ drive from Beijing Railway Station; 39 km, 1 hour’s drive from Beijing Capital International Airport. 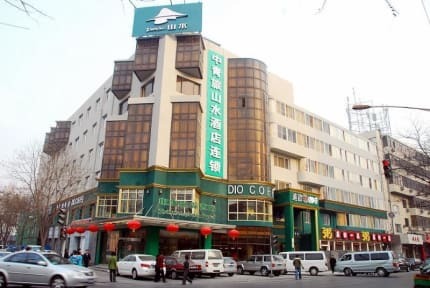 The hotel has 167 various guestrooms and many facilities like café, Chinese restaurant, KTV and porridge house. I relocated to this hotel from my hostel to be close to the rail station as I was leaving the next day. When I got to the hotel, they said they didn't have my reservation & offered no help. Fortunately, Hostelworld did help & got me a room although I had to wait 3 hours. The A/C didn't work so they offered me a new room. The A/C didn't work there, either, I'm sure they just had the A/C off & it was hot. The room was clean, no problems there. There are no common areas, it's a hotel, not a hostel.